Isn't it interesting to know why sheds became so popular today? 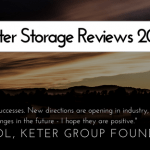 Let's take a trip down memory lane before jumping onto our Keter Sheds Reviews 2018. Isn’t it interesting to know why the garden shed has become so popular today? 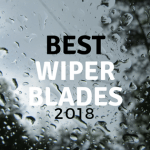 That’s why we’re going to take a trip down memory lane before jumping onto our Keter Sheds Reviews 2018. Long ago, mankind had to build shelters with any material they could find. They would use bones, rocks, wood, plants and animal skin to cover these shelters. The more shelter an individual can construct, the more storage they have and the more possessions they can keep inside them. That’s why they built as much shelter they can to store as many materials as they could. This is might be the reason why sheds have long become a popular outdoor item for people until the modern times but we have yet to figure out. From using animal remains, sheds are now built with different heavy-duty materials and they have been a part of most British homes. Aside from wood and metal, plastic garden sheds are also making their way to the top because they are maintenance free, weatherproof and fadeproof. One of the leading manufacturers of plastic garden sheds is Keter who have already been internationally recognised for their top quality products. With that said, we are going to do a roundup on the Best Keter Sheds you can get this 2018. We will carefully review each Keter plastic garden shed to see why people have been raving about them for a long time now. 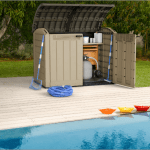 How did we review the Keter Storage Sheds? The Keter Sheds come in different sizes and we chose to review so that you have options to choose from. Whether you’re looking for a shed to store garden tools or you want to build a home ‘slightly’ away from home, we got you covered. Remember that in choosing the right shed size, consider the whole area of your garden. Leave some space enough to walk around the shed so that you can clean all sides when necessary. Keter products are made of heavy-duty plastic that can be moulded into different designs. We almost argued on which Keter shed had the best design because we had different picks. Nonetheless, we all agreed to include them into our top picks because they are all equally aesthetic that we’d love to have them in our own homes. Keter storages are all made of resin which is a hard plastic material. Their products are all weatherproof which means your items inside are kept dry no matter how extreme the weather condition is. Unlike wood and metal, Keter sheds don’t need any maintenance to keep its quality. It’s also fadeproof because the colour is already mixed into the material instead of using paint. Although plastic is a material that’s known to be light, these sheds are made of heavy-duty floors so they can withstand even strong winds. An effective and functional garden shed should keep everything safe and dry inside. No matter the weather, a garden shed should be strong enough to withhold strong winds to keep the items inside clean and dust-free. As practical buyers ourselves, we want to make sure that the products have guaranteed warranty. In case anything goes wrong, we all want to assure ourselves that we will get our hard-earned money’s worth because garden sheds are definitely an investment. Small garden? No problem! 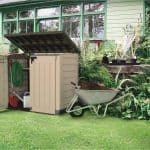 The Keter 4 x 6 Factor Outdoor Plastic Garden Shed is your ideal small outdoor storage solution for garden tools, toys, bicycles, barbecue and other equipment. It has a wood effect on the panels and its weather resistant as with any Keter product. It also boasts a heavy-duty floor base that can support heavy items and keep them safe inside. This garden shed has a window for natural lighting and the inside is well-ventilated which means you won’t drop a sweat when transporting items. The Keter 6 x 3 Factor Resin Shed can provide plenty of space to keep your garden tools and large equipment out of sight. You can easily bring large items inside and out of this garden shed since it has double-wide opening doors that won’t get in the way. This narrow shed can be used as a small workshop or a playroom for the children. There’s no need to worry about air circulation as the shed is well-ventilated to keep you cool when you’re inside. Additionally, its elegant wooden effect on the panels will definitely blend in with your garden’s landscape. Moving on with a slightly bigger shed, the Manor 6 x 5 Outdoor Plastic Garden Storage Shed offers a generous space for your garden storage needs. 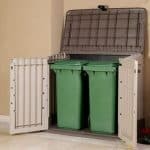 It can accommodate large garden furniture, mowers, barbecues and other large equipment you need to store in one place. Integrated windows allow natural lighting to enter the shed to help you look for small garden tools around large equipment inside.This garden shed has ventilation ducts included allowing air to circulate inside. This garden shed can house your ladder, bicycles, BBQ, furniture, and all other things you want to hide, except your secrets. Kidding! The Keter 6 x 6 Factor Shed is a solution to your storage problems and it can even become a hideout place if you want to stay somewhere quiet. It has an equally tall and wide space for you to organise your things in the shed. Staying inside the shed is possible if you want to utilise it for something else apart from a storage. It has a skylight, windows, and ventilation grills that allow fresh air and natural lighting to enter the shed while your inside. You should consider adding this Keter 8 x 6 shed to your household if you have a lot of space in your garden. This can keep your bicycles, furniture and other outdoor items dry and safe. It offers a spacious storage for your garden items and also has some space for you to work on a project or just hang out when you feel like appreciating nature. You can even watch the rain while you’re inside this garden shed since it’s weatherproof and it can stand strong winds. This shed has enough space for you to walk around and put things where you want them to be. There are also two shelves included in this shed to store items you want to keep off the floor. After reviewing each of these Keter garden sheds, we had to agree that the best one among them is the [amazon link=”B00DH8J210″ title=”Keter 6 x 3 Factor Resin Shed” /]. Aside from the fact that the design absolutely makes it look like its made of wood, the size is just enough if you don’t have a large space in your garden. It can serve as a storage or a small workspace. Likewise, it can be a place to chill when you just want to free yourself from all the stress. Nonetheless, all of these Keter sheds can be of help to you when it comes to storage and shed needs. We reviewed each shed of different sizes for you to pick one that you think fits best for you. If you have a beautiful small garden, the [amazon link=”B00AFSTZA8″ title=”Keter 4 x 6 Factor Outdoor Plastic Garden Storage Shed” /]. is the best one you can get. While if your garden is spacious enough for a large shed, then you can go for the [amazon link=”B00AFSU05C” title=”Keter 8 x 6 Factor Outdoor Plastic Garden Storage Shed” /] to keep your belongings in place. It’s always better to go for a bigger storage if you have enough space for it. Buying your own garden shed is a worthwhile investment. That’s why you need to make sure that you choose one that you think best fits your wonderful patio.